As winter approaches, gradually lower the mowing height of your mower. Winter should begin without any young, tender growth that makes your lawn more appealing to winter diseases. Besides, new growth on the lawn is vulnerable to dry out after the first winter winds come through, which will give you a brown winter lawn. So for the sake of lawn maintenance, as winter approaches, begin to gradually reduce the cutting height on your mower, until you are almost, but not quite, shaving the lawn. However, be sure to do this in several steps to avoid suddenly removing all the green leaf tissue and damaging the turf. In late fall, be sure to give your lawn a final fertilization. Inactive during winter, your lawn won’t use the fertilizers immediately. Much like mammals bulking up for the cold, your lawn will store these nutrients in its root system and take full advantage of them at the first signs of spring. 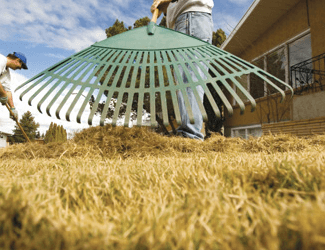 Clear your lawn of any debris like logs, toys, or gardening equipment. Once snow comes, these objects can smother your grass, damage your turf, and leave your lawn more vulnerable to diseases. Be sure to aerate your lawn before the first freeze. Thatch will only get worse with the affects of winter. A good aeration, along with a round of fertilization, will set the stage for bountiful spring growth. Winter is a great time to learn more about your garden and your lawn in particular. Take this time to buy some lawn maintenance books and research the Internet for tips on how to keep a beautiful lawn and garden. © 2019 The Cutting Edge. All Rights Reserved. WordPress Customization and Design by The Web Dude.